Style inspiration knows no gender—a point that's particularly hard to avoid when photo shoots like Joe Keery's for GQ happen. Today, we're here to highlight a whole dozen of our favourite stylish men, the ones who will take the fashion world by storm this 2018. The sartorially suave lads you're about to feast your eyes on come from all over the place, be it your favourite TV shows, hit movies, the music industry—even international social media influencers are included. Our goal once you're done scrolling? For you to hit "follow" on each of their accounts. After all, innovative style inspiration lies ahead, and we wouldn't want you to miss any of it. 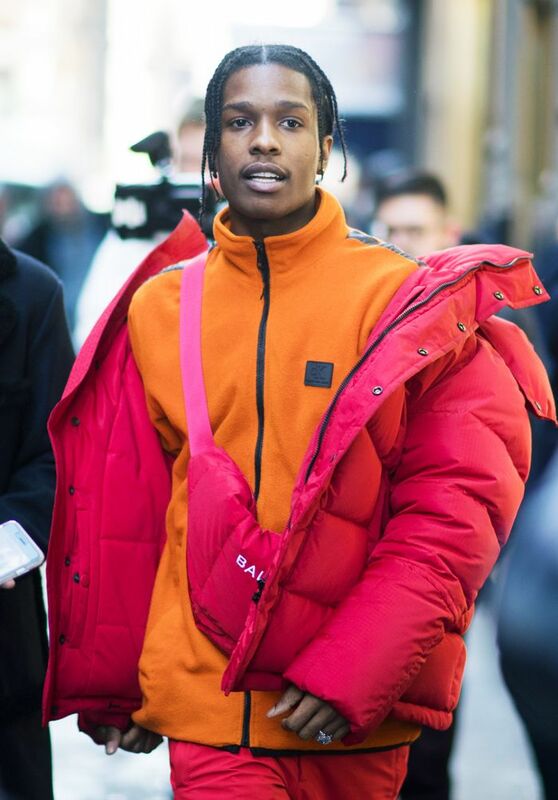 You know ASAP Rocky for his music, but what we want to make sure you never skip over is his style. Frequently spotted wearing the latest Balenciaga sneakers, becoming the face of heritage brands like Calvin Klein, and much more, this artist is one to watch for his style and his acceleration in the fashion industry. Okay, this one might not come as a huge surprise, but it would be a crime to not include this rising star, who continues to impress with not only his recent performances in both Call Me by Your Name and Lady Bird but also with his sleek yet forward style. We have a feeling 2018 will present a huge style evolution for Timothée as his presence in the spotlight grows. There are truly no words to describe how obsessed we are with Leo Mandella's feed. If you want to see what true, unfiltered original style looks like, hit follow ASAP. Whether he's sporting the latest Supreme collaboration, covetable new sneakers, or designer sportswear you didn't even know existed, Mandella will blow you away with his creativity post by post—trust us. A Riverdale cast member we don't talk enough about is Charles Melton. Melton plays the character of Reggie Mantle, Archie's rival in the series. This football player–turned-model-turned-actor is very clearly easy on the eyes, but his style isn't bad either. We see big things in the near future for Melton, who's constantly repping vintage-inspired bomber jackets, cool sunnies, and hairstyles worth fawning over. Cao Minh Thang, also known as Decao, owns a shop in Vietnam called Hanoi and is one of the biggest Vietnamese social influencers, period. Currently boasting a total of 287K followers on Instagram, this man is no flash in the pan. Describing his style is impossible—words truly can't do it justice. Excluding Cole Sprouse from this roundup of male style icons is not an option. No one does hipster, laid-back, heritage style quite like Cole, and for that, we're forever grateful. This man (you're welcome, Cole) has clearly proved to the world that The Suite Life of Zack and Cody was just the start of his stardom and his style—and thanks to Riverdale, the stardom part is officially inevitable. Booking shoot after shoot, Cole has yet to appear in an outfit we don't love. You could call this a challenge to see what else he can come up with in 2018. @Cole, do you accept? I love Harley. Also known as Flume, the talented Australian musician who has graced his presence at nearly every major music festival also has a knack for chill cool-kid style, but for men, if that makes any sense. Glance through his Instagram and you'll see what I mean; plus you can expect a few laughs at his witty captions. A GQ shoot with Joe Keery really put his style game on the map, and the Stranger Things star has only continued to make his mark in the fashion world. Famous hair aside, there's no denying the styling power Joe has in a great suit, vintage denim jacket, or worn-in sneakers. Yes, folks, we live in a time where "internet personalities" are a real thing, and Cameron Dallas is here to prove that to us. With a humble 20.7 million Instagram followers, Cameron uses his massive social platform to serve up forward, on-trend looks that rake in the likes. Miles Heizer plays Alex Standall in the popular Netflix series 13 Reasons Why, and with a highly anticipated season two coming down the pike, there is no cast member who won't be showered with attention. While Miles might not be widely known for his sense of style, we've been eyeing him for quite a while now, and from what we can see, he's really coming into his own, and the drop of a new 13 Reasons Why season will only expedite that.